The final countdown for the Mapfre Middlesea J70 Med Cup is on with only a few days to go before racing kicks off this Friday, 5th June in the afternoon. This event is the pinnacle of the local J70 circuit, the moment all the top sailing teams have been waiting for to prove their mettle. The regatta, which is hosted jointly by the J70 Association Malta and the Royal Malta Yacht Club, is set to be a spectacle both on and off the water. Races will be held off the Sliema front Friday afternoon, all day Saturday and Sunday morning. Weather permitting, the final series, where the podium positions will be decided, will be raced inside Marsamxett harbour in perfect view of the Royal Malta Yacht Club. Sunday afternoon will be the climax of the event with a Pimms bar set up on the Yacht Club's terrace in full view of the racing. Apart from the prestige of winning the first edition of the Mapfre Middlesea J70 Med Cup,competing teams have a lot to fight for with prizes including beautiful artworks from Celia Borg Cardona as well as bottles of premium champagne by Veuve Clicquot. 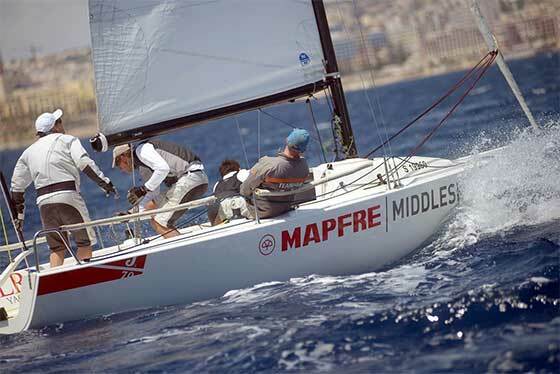 So which team will win the Mapfre Middlesea J70 Med Cup?